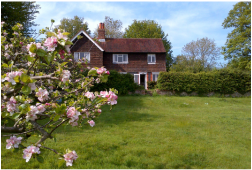 A welcoming Sussex cottage, set in spacious gardens amidst glorious downland countryside. 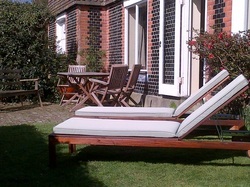 ​Self-catering, detached, for up to six guests. Authentic and interesting, yet comfortable and practical, at Streatwick you'll feel nestled in the heart of downland Sussex. Available for short stays, and longer visits, the accommodation combines modern comforts with an Arts & Crafts/Bloomsbury feel. With some of the finest unspoilt South Downs views in the county, and located in a tiny hamlet down a quiet private track, the cottage is secluded and private, yet easily accessible. Both Ditchling and Plumpton are within 30 minutes' walk, and there is loads to do nearby by foot, bike or car. Surrounded by half an acre of lawns and gardens​, there is also a southfacing terrace for eating al-fresco and sunbathing. Shady hornbeam and sycamore trees line the garden, and there is a flat side lawn for boules, badminton, and barbecues. ​Set on an ancient ridge, in a tiny hamlet, Streatwick lies just south of the Roman 'Greensand Way' between Ditchling and Plumpton. This resonant landscape is exactly where Roland Emmett built his flying car 'ChittyChittyBangBang' (in the old forge next door), and where Raymond Briggs envisaged his 'Snowman' flights. The distinctive county town of Lewes is 7 miles away, and Brighton is 25 minutes away on the other side of the Downs. This is an Area of Outstanding Natural Beauty, in the South Downs National Park, which is defined by the curving scarp slopes of the South Downs, now also a UNESCO Biosphere area. Eve Hanley, Streatwick, East Sussex, BN6 8RT.